Sakai Community DocumentationSakai 19 User Guide (English) Sign-UpHow do I create a meeting? After you click Add the meeting information screen will appear where you can enter all of the information for your meeting. This field will identify the meeting in this site’s list of meetings. If there is more than one instructor or site owner, you may select a different name in the drop-down menu. It will default to the currently logged in user. This field will appear in the Meeting Details. Note: Once you have entered a location at least once for a site, it will appear in a drop-down menu. You may add a new location by clicking on the + enter a new location link. Note: Once you have entered a categry at least once for a site, it will appear in a drop-down menu. You may add a new category by clicking on the + enter a new category link. Enter a description of the meeting or event. Zoom: Enter a description of the meeting or event. 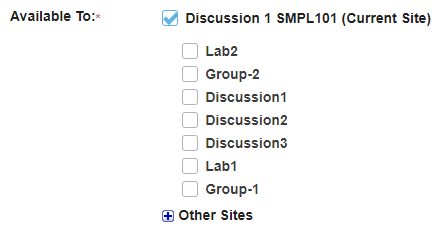 This field appears on the Meeting Details and the student Sign-up screen. You may click the Add Attachments button if you would like to browse for and attach a file to your meeting. Fill out the dates and times when the meeting will begin and end using the date picker. To set up recurring meetings, choose an option here. Any of the meeting types can be recurring. Selection of a meeting frequency other than “Once Only” will create a series of entries in the meetings table with the same name but different details, where any of the individual entries can be modified as necessary. Select begin and end times for sign-up. Enter the point at which the meeting should be opened for sign-up. Before then, participants will not have an active Sign-up button next to a meeting entry. To allow immediate sign-up, choose “Start Now” from the drop-down box. Also, enter the point relative to the meeting at which to close the sign-up process. This blocks further sign-up by participants, and also blocks cancellation of a meeting for which a participant has already signed up. This period is measured from the scheduled meeting end, allowing sign-up even after the meeting has started, when that is appropriate. Note: Sign-Up begin and end times are only available for single slot and multiple slot meetings. If you wish to take attendance for this meeting, select the Attendance check box. The relevant options for each of the three meeting types appear when that meeting type is selected via its radio button. See What are Sign-Up meeting types? for more information. Options to choose between Max number (in which case, enter the number of participants allowed) and Unlimited. Options create timeslots, either computed to occupy a single continuous time span, or occupying separate irregular time spans manually defined, covering one or more days. Each method creates a single meeting with multiple entries in a timeslot table. Number of slots available for sign-up: Enter the number of individual timeslots over which to divide the meeting time. Number of participants per slot: Enter the number of people that can sign up for each slot. Advanced user-defined timeslots: Allows a multiple-slot meeting to be defined as a set of irregular timeslot choices, over several days at different times. (Each person can sign up for only one.) Select this checkbox,” then select the “Edit Timeslots” link that appears. Enter new timeslots with the “Add a new timeslot” link, edit the data, and delete extraneous ones with the red X. This option does not allow unlimited participation. A warning that this meeting covers more than one day can be ignored. Continue to the second page by clicking Next. This will take you to the Meeting Summary, to verify the details set so far, then complete the meeting settings. Review settings and select notification preferences. Zoom: Review settings and select notification preferences. Display Participant Names: "Yes" means that names of participants will be visible to others. Send notification: Check the appropriate box to manage email notifications when participants sign up or cancel. Meeting Coordinators: Select the coordinators to receive notifications, if enabled. Announce Availability: "Yes" means that all the potential participants will receive e-mail announcing that this meeting has been published. 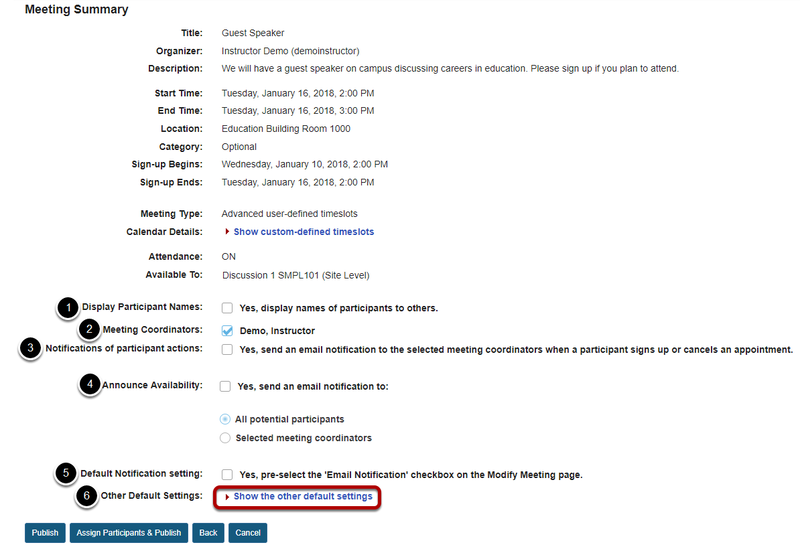 Default Notification setting: "Yes" means that the notification box will be selected on the modify meetings page. Other Default Settings: Click Show the other default settings to view additional meeting options. Allow Wait List: "Yes" means that a Wait List will be kept, and participants can join it if this meeting is filled to capacity. Allow Adding Comment: "Yes" means that a participant can add a comment during sign-up. User ID Input Mode: Yes, I want to use User ID input mode for adding participants. – allows organizer to use User Id rather than choosing from drop down list. Useful for very large classes where drop down list is very long. Auto Reminder: "Yes" means that all attendees of the meeting will receive an e-mail reminder one day in advance. 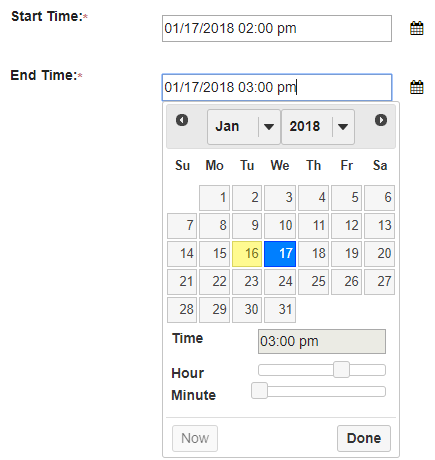 Publish to Calendar: "Yes" means that the meeting will appear on this site’s Calendar tool, regardless of attendance status of the current user. Create groups for timeslots: "Yes" means that groups will automatically be created for each time slot. You may manage these groups via Site Info. Max # of timeslots per participant: You may select more than one timeslot per participant if desired. Publish by clicking either Publish or Assign Participants & Publish. 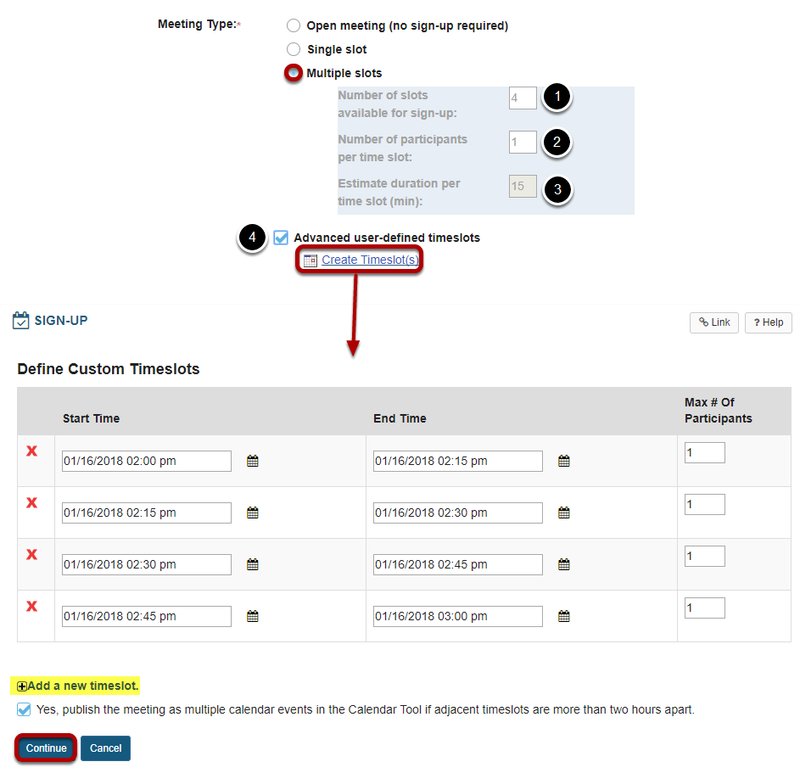 You have the option of assigning participants or allowing them to choose their own timeslots. If you do not choose to assign participants at this time, you may do so later by editing the meeting settings. Prev: How do I view meetings in Sign-Up? Next: How do I edit a meeting?